Was AKRF really hired to do a study of neighborhood conditions? It was hired to "prepare a blight study in support of the proposed project"
As noted yesterday, probably the most astounding statement during the January 5 oversight hearing on eminent domain was the statement by Anita Laremont, General Counsel of the Empire State Development Corporation (ESDC), that consultant "AKRF does not find blight. Our board finds blight." "AKRF does a study of neighborhood conditions," she continued. "And they give us a report, and we make a determination based on that whether or not the area is blighted." However, AKRF, to Laremont's knowledge, has never turned in a report that doesn't lead to a finding of blight. That's no coincidence. Because AKRF isn't hired to do a neutral study of neighborhood conditions. 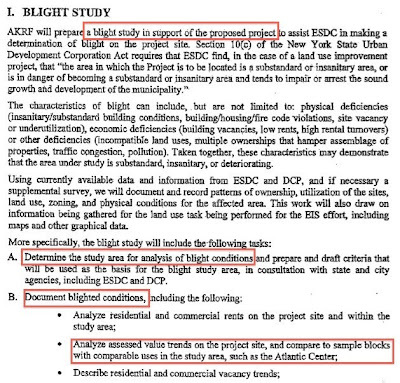 It's hired to "prepare a blight study in support of the proposed project," as shown in the contract scope for AKRF's work for ESDC, excerpted at right, part of a document I obtained via a Freedom of Information Law request. It was hired to "[d]etermine the study area for analysis of blight conditions" and to "[d]ocument blighted conditions." It did that. Curiously enough, among those blighted conditions, AKRF was supposed to "[a]analyze assessed value trends on the project site, and compare to sample blocks with comparable uses in the study area, such as the Atlantic Center." AKRF didn't do that, perhaps because it might have suggested that the project site wasn't so blighted. Or, perhaps, because it would have come closer to the task that Laremont described, of studying "neighborhood conditions." How many times can my jaw drop at the shameless abuses of power (read: illegalities) of my government? Our government can't be toppled in the ballot box (one party state, and all), but maybe satire will work. The Eastern Germans, Russians, and many others who have suffered under one-party despots have made great use of satire. Laughing at these fools and their outright lies might be our only recourse. Aside from Norman Oder's brilliant reporting. Perhaps a funeral is in order: Let us put to rest our faith in our govt. It departed, tragically, long ago, but I am only now coming to terms with its great loss.